Typ-, ausdrucksvoll, sehr gut pigmentiert, kraft-, gehaltvoll, trocken und fest, richtige Größe, kräftiger Kopf, ausgeprägte Maske, hoher Widerrist, sehr gute Rückenlinie und Lage und Länge der Kruppe, sehr gute Winkellagen der Vor- und Hinterhand, ausgeprägte Brustverhältnisse, gerade Front und Schrittfolge, flüssige, weit ausgreifende, kraftvolle Gänge, wirksamer Nachschub, freier Vortritt. Sicheres Wesen, TSB ausgeprägt; läßt ab. V. Typ-,ausdrucksvolle Gesamterscheinung mit sehr korrektem, anatomischen Aufbau und sehr guter Pigmentierung. VI. Blutlich ohne Einschränkung für alle passenden Hündinnen geeignet. I would like to see more photos of the offspring after him. sambo looks fantastic in the new picture. Great work margit. Great male, I saw him in Ulm- excellent! Best luck in BSZS 2010 Nurnberg, outstanding bitework and top V (or VA)! JUST LOVE THIS BOY - a beautiful male. Congratulations to his owner and breeder. Yes, he looks very "nice".. So let's hope that he also has heritaged the mentally good genes from his mother-side! Simply stunning.. jst luv him!! All da vry best wishes for rocking future!! 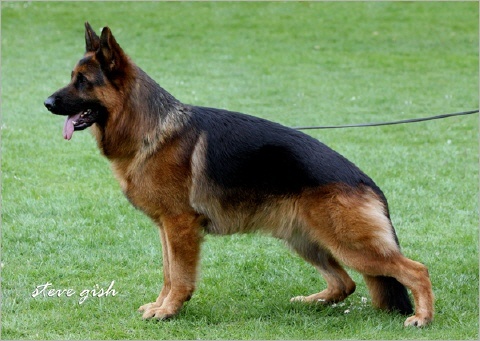 I just came accross this photo of Sambo v Arlett...What a fantastic speciman of a GSD male!!! As you know, I have long been a fan of your dogs and of your breeding program..and now I am a HUGE fan of Sambo!! !...In my humble opinion, he is the best you have ever bred and I am sure that he will be among the best of the best at this year's BSZS...I predict that he will be the Sieger in his age group this year and I predict that he will surely be a future VA and hopefully a future 'WORLD SIEGER'!!!!! I WISH YOU THE BEST WITH SAMBO..."GOOD LUCK"!!!!!!!!! I also found some photos of Santana and Diavola...all I can say is WOW..surely they will be future stars. And not to forget 'CLOONEY v ARLETT'...a future "SUPER STAR"!!!! Thank you for allowing me to share your wonderful bloodlines...I am grateful to you. Sambo is a fantastic male and I am sure he will go to the top this year in Ulm. All the best for the next few shows! !